We've lived here for 10 year this month and I can't even believe I finally got my gallery wall done? I've been scared to death of this wall for as long as I can remember. I mean don't get me wrong I've had several different, big pieces of art hanging there, but it just never did it for me. You know what I mean? Please forgive the picture quality, I really do have a brand new "big girl" camera, but am still learning how to use it. Also, please excuse the glare from my windows in the living room. To get the right picture I had to get down closer to the floor and try to shoot it upwards. I am just thrilled I finally got it done and the best thing is I can add on to it or change it up a little with each season. Hope you are inspired!! The complete details are here. Oh my gosh, I LOVE it!!! I am the same way...guess I have about 6 months to get over my fear if we are allowed to take 10 years to figure this out! 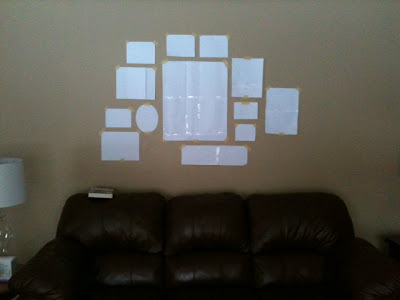 I am scared of all the walls in my house, and rarely get brave enough to hang anything up. But, this looks fabulous, yes, very inspiring!! Thank you Taryn!! We can work on your walls now, just let me know and I can help you too. I was so afraid of holes in the walls, but they can be repaired so easily. Also, I didn't recover the leather, we sold it on craigslist and purchased the ektorp series from IKEA. I am loving it!!! Thank you Ange! Great, please do post a picture when you are done with it. I love seeing everyone's work and creativity. this looks so great! Don't worry about it, I keep meaning to hang some pictures up in our stairwell, but it's been 5 years now...sighhhhh!!! thanks for linking up to our blog party. Wow, it looks great! I have been hesitant to do something like this and you have given my confidence! 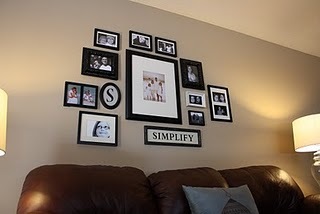 That looks gorgeous and it's really similar to a frame arrangement i did in our hallway recently. It's on my blog. Your blog is great! I'd love for you to come by and join my link party. I loved everything about it and that Simplify sign is perfect. Great job. looks great, love the way you arranged the wall. thanks for sharing this at my party! Very nice!! New follower! love your ideas.